Have a motorcycle? Think that a well-padded crash helmet is sufficient to protect your ears from noise? It’s easy to forget that we’re not too affected by motorcycle-generated noise. After all, we’re not talking to passengers like you can in a car and unless you have a built-in comms system we’re probably not struggling to listen to radio speakers. Outside noises such as traffic and car horns are easy enough to hear so why should be worry about anything else? Not all ears are the same size and shape and it stands to reason that identical products will not always fit everyone. Therefore a custom-shaped personal ear plug is surely worth consideration. 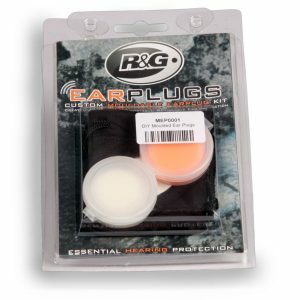 With a keen eye on the instruction manual and a steady hand I’d certainly try the R&G Moulded ear plugs. These Pinlock ear plugs have a three tiered shape which should give them a superior holding ability and remain relatively ‘pressure’ free. The filter feature also allows non-offensive sounds to be heard. The length of exposure of excessive noise. An exposure to 85 decibels of noise longer than 8 hours may lead to a permanent impairment of hearing. Only two hours exposure is required for that when exposed to levels exceeding 100 decibels. Wind noise on a motorcycle can easily exceed 85 decibels. Is the answer a quieter bike? Not really. A leading cause of ear damage for motorcycle riders comes from the running and rumbling wind going through the vents of their helmets. We all need ventilated helmets for a cool flowing of air and to reduce sweat and odors but trapped air creates an echo chamber around the ears that resonates into the ear drum. It would be a little like holding an inflated balloon against your ear and flicking the balloon with a small stick. In other words, an expensive, well-padded and ventilated helmet gives you plenty of protection in some areas but not necessarily around the ears. Good ear plugs will shield you from the noise created by air rushing around your helmet as you ride. These expand to fill the ear spaces and therefore subject those spaces to constant pressure which some riders may find uncomfortable. There’s a tendency to push them in harder when they work themselves out which increases the soreness. However, a decent soft pair will do the job and you can always shave them down a tad to make them fit. It’s a trade-off between comfort and fit. We don’t want them falling out or becoming dislodged on the move. 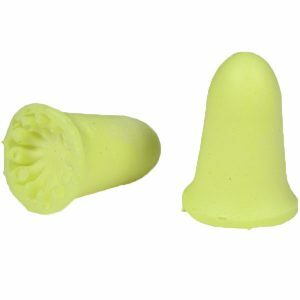 Sponge ear plugs are very cheap and bought by the dozen. Washing them periodically helps remove dirt but they can change shape and lose their ability to stay in place. Picking up an ear infection or barotrauma can prove costly and unpleasant so it’s worth keeping your ear protection devices clean and functioning. If you’re really into ear plugs (or they’re really into you) then consider a custom-made set by popping along to a specialist and having your ears measured. These Pinlocks are silicone-free and reusable. They block most of the high-pitch engine noise and wind whistling while allowing the rider to hear car horns, traffic and sirens. They can also be used in combination with a comms system. This is achieved through a tiny filter system in each plug. The earplugs allow some air-flow into the ear reducing irritation, heat and avoiding that blocked sensation. The Pinlock’s do not affect the balance of the motorcyclist as they’re made out of silicone-free medical grade TPE (Thermoplastic Elastomer) with low allergens. 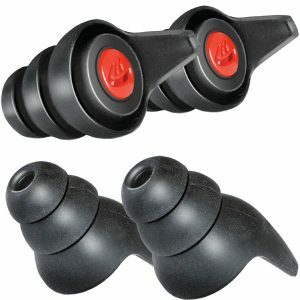 This product involves a little bit of work on the rider’s part but if the instructions are followed properly then these ear plugs may prove to be the ideal solution. They work by mixing two components together, inserting the combined material in your ear and leaving it to set for 15 minutes. The result should be a perfectly formed ear plug custom made to fit your ear. It is important to ensure that the material protrudes far enough into your canal allowing some stability later when it’s ready for use. Otherwise it’ll just sit on the edge of the ear and run the risk of coming loose. The Bike It ear plug is a soft foam model which comes in a clear key fob. This helps protect the plugs from damage and also dirt which may lead to ear infections. Their bright colour makes them easy to spot should you drop them or leave them somewhere. The Oxford ear plugs are made from a slow expanding environmentally friendly polyurethane foam material. Included is a protective pocket case which not only helps them remain clean but allows them to regain their shape after use. The evenly distributed pressure gives flexibility, a good seal and optimum comfort. Auritech ear plugs have noise cancelling patented ceramic filters. This allows normal conversation while effectively tuning down other noise with no muffling effect. Silicone free hypoallergenic thermoplastic allow greater fit and control. 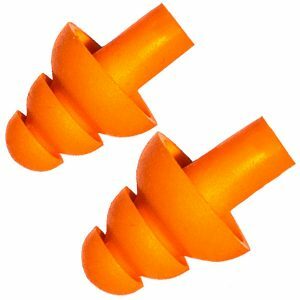 The ear plugs are shaped in three size cascading sections for better contact inside your ear. The plugs come with a protective and waterproof tube-style casing which attaches to a key ring. Awareness of excessive noise sources and potential risks should inspire a rider to invest in some form of ear protection. A crash helmet isn’t enough even if it’s an all-surrounding full-helmet with extra padding. Motorcycle noise is sometimes insidious. The continuous exposure can be more harmful that short term periodic bursts of noisy exhaust pipes. We bikers should take note and ensure we’re not unwittingly heading towards permanent and irreversible hearing damage. Experiment with different types of ear protection until you find ear plugs that work for you and don’t become complacent with their use. Remember also to keep them clean and free of bacteria to avoid infection and lengthy medical treatment. They’re also useful in non-biking related environments such as family gatherings and school runs.